"Spice" refers to a wide variety of herbal mixtures that produce experiences similar to marijuana (cannabis) and that are marketed as "safe," legal alternatives to that drug. Sold under many names, including K2, fake weed, Yucatan Fire, Skunk, Moon Rocks, and others — and labeled "not for human consumption" — these products contain dried, shredded plant material and chemical additives that are responsible for their psychoactive (mind-altering) effects. Labels on Spice products often claim that they contain "natural" psycho-active material taken from a variety of plants. Spice products do contain dried plant material, but chemical analyses show that their active ingredients aresynthetic (or designer) cannabinoid compounds. For several years, Spice mixtures have been easy to purchase in head shops and gas stations and via the Internet. Because the chemicals used in Spice have a high potential for abuse and no medical benefit, the Drug Enforcement Administration (DEA) has designated the five active chemicals most frequently found in Spice as Schedule I controlled substances, making it illegal to sell, buy, or possess them. Manufacturers of Spice products attempt to evade these legal restrictions by substituting different chemicals in their mixtures, while the DEA continues to monitor the situation and evaluate the need for updating the list of banned cannabinoids. 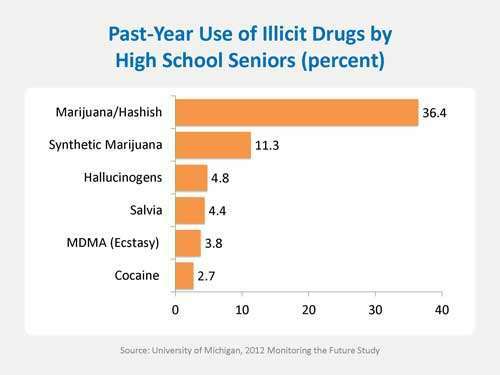 Spice products are popular among young people; of the illicit drugs most used by high-school seniors, they are second only to marijuana. (They are more popular among boys than girls — in 2012, nearly twice as many male 12th graders reported past-year use of synthetic marijuana as females in the same age group.) Easy access and the misperception that Spice products are “natural” and therefore harmless have likely contributed to their popularity. Another selling point is that the chemicals used in Spice are not easily detected in standard drug tests. Some Spice products are sold as “incense,” but they more closely resemble potpourri. Like marijuana, Spice is abused mainly by smoking. Sometimes Spice is mixed with marijuana or is prepared as an herbal infusion for drinking. How Does Spice Affect the Brain? Spice users report experiences similar to those produced by marijuana—elevated mood, relaxation, and altered perception—and in some cases the effects are even stronger than those of marijuana. Some users report psychotic effects like extreme anxiety, paranoia, and hallucinations. So far, there have been no scientific studies of Spice’s effects on the human brain, but we do know that the cannabinoid compounds found in Spice products act on the same cell receptors as THC, the primary psychoactive component of marijuana. Some of the compounds found in Spice, however, bind more strongly to those receptors, which could lead to a much more powerful and unpredictable effect. Because the chemical composition of many products sold as Spice is unknown, it is likely that some varieties also contain substances that could cause dramatically different effects than the user might expect. What Are the Other Health Effects of Spice? Spice abusers who have been taken to Poison Control Centers report symptoms that include rapid heart rate, vomiting, agitation, confusion, and hallucinations. Spice can also raise blood pressure and cause reduced blood supply to the heart (myocardial ischemia), and in a few cases it has been associated with heart attacks. Regular users may experience withdrawal and addiction symptoms. We still do not know all the ways Spice may affect human health or how toxic it may be, but one public health concern is that there may be harmful heavy metal residues in Spice mixtures. Without further analyses, it is difficult to determine whether this concern is justified. ©2019 Providence Working Canines, Inc.